2 Register for May Race & Friday Fearless Events if you haven't already. 5 TURN YOUR NUMBERS PRODUCTION & HOW MANY ACTIVE! Share your career conference takeaways. #1 you need to reflect on the pieces you learned what was new information? new ideas you want to implement right away? what are quotes you want to write down somewhere and keep? #2 how did the inspiration you received affect your goal? #3 what is your goal and deadline for what you want? #4 what specific things do you need to get in place or FIX in order to reach your new goal!? #5 how clear is your vision of what you want? or are you still cloudy? #6 how clear is what you NEED TO DO to get what you want? #7 what could keep you from reaching your goal? The but sisters. What are you ALLOWING to derail you and stop you? Tell me how did recording yourself go today? Watching yourself close a party? #1 Hold 1 party this week! #2 Get 35 new leads this week! #4 note how many buts you hear in your mind our out loud from yourself this week. CLOSING THE EVERYTHING @ your Party! BOOKING FOLLOW UP & what to DO with her there! #2 Hold 1 Party this week completing a minimum of 8 faces. #3 Lead Generate 25 new leads you ll need minimum of 100 new leads on your desk by March 31 to have to book April with! #5 Book one party for each remaining week this month! #6 Hold your hand on your head DAILY and say I am made for greatness and blessings are chasing me down! #1 Hold 1 Party this week completing a minimum of 8 faces. #2 Lead Generate 20 new leads = = you'll need minimum of 100 new leads on your desk by March 31 to have to book April with! #4 Book one party for each remaining week this month! 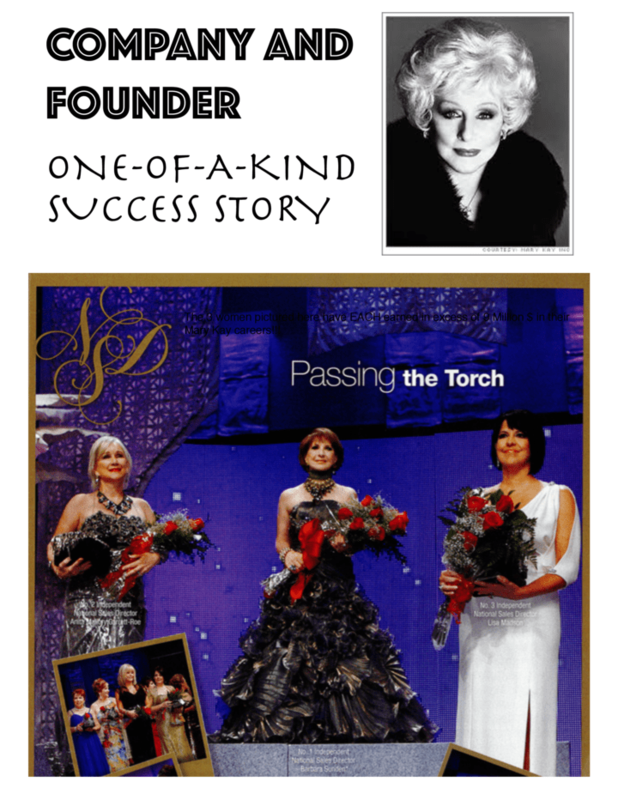 #5 List 50 reasons being highly successful in Mary Kay matters to you! 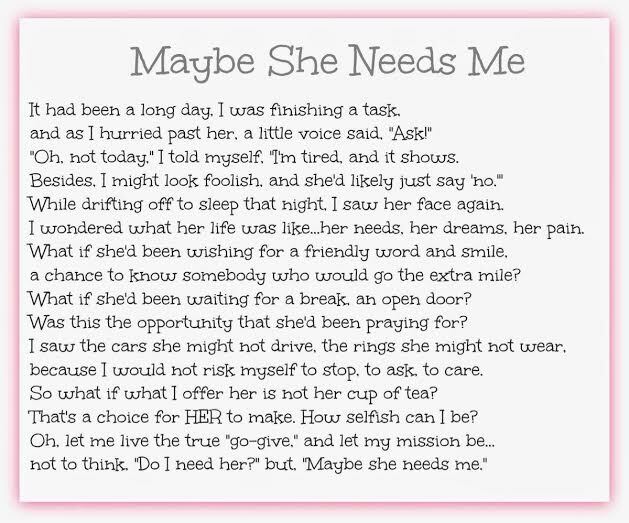 #6 Read Maybe She Needs Me DAILY this week! #7 Hold your hand on your head DAILY and say I am made for greatness and blessings are chasing me down! #1 Set your March profit goal! Make the envelope, put a picture of what you re buying with that envelope! Then set the amount and keep your equation going as you do your deposits ! #4 1 SCC Held (you better have two booked so 1 will hold) FINISH 8 FACES! 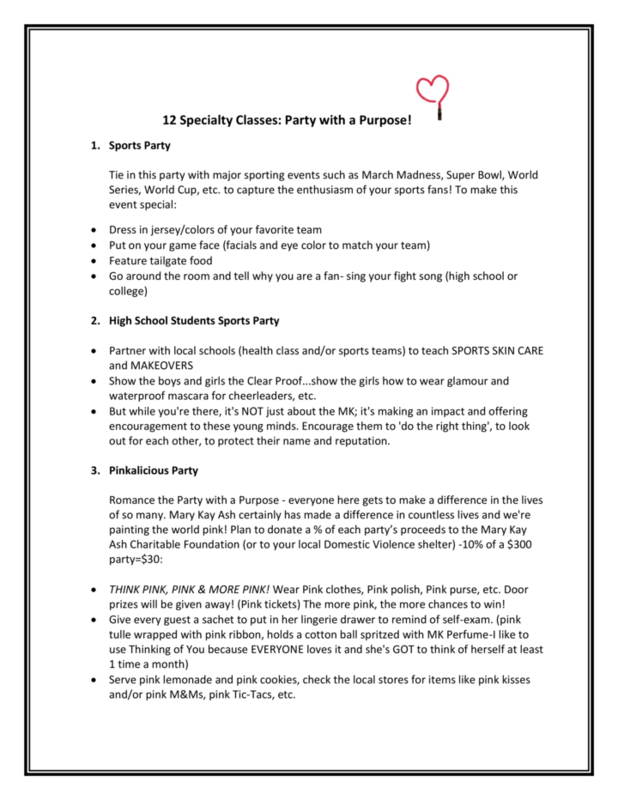 #1 HIGH HEEL PAGE: HOW CAN YOU OWN IT? List the qualities of what working to your potential would look like! #2 Do recruiting notebook with 7 women and give them a packet! And follow up! = 15 for the month! #3 6 faces this week! #5 Book a party for next week! #6 List how many #s you ve worked in the last 30 days! Finish your February money goal envelope for a homework pass! #1 You must go through your recruiting notebook with 5 women and give them a packet! And follow up! #2 Put your hand on your head & say "I'm willing to work hard to create change!!!" #3 Envelope is made now you need a minimum of $100 in there this week! #4 You need to do at least 3 faces this week! 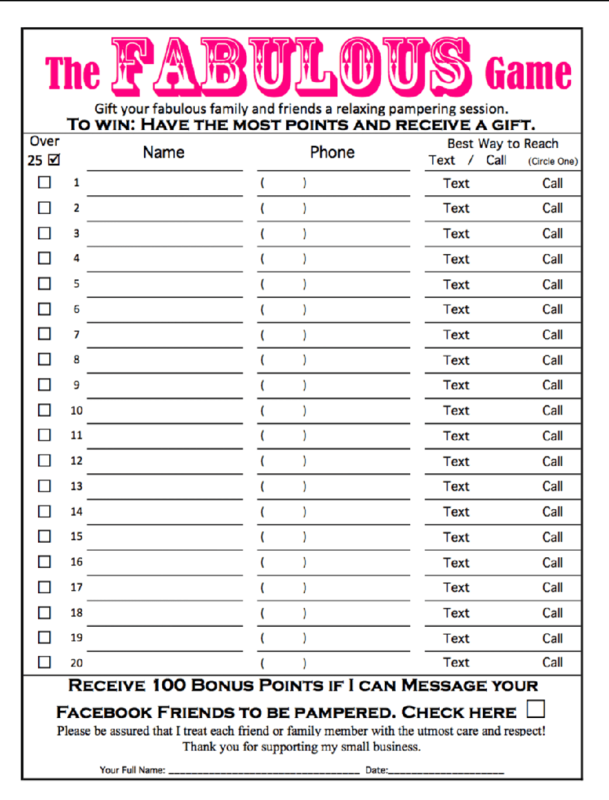 #5 Warm chatter 3 women, when you get 3 phone numbers from WARM CHATTER (not referrals) you get a homework pass! So excited everyone was on tonight! So some of you found me on google plus and some had to call in! #1 you must go through your recruiting notebook with 3 women and give them a packet! And follow up! #2 find your bubble sheet in start something beautiful and make a Xerox copy and and get through your attack list! The entire list this week. #4 Put your hand on your head and say out loud every day "I can do hard things" one time every day til next Monday! I'm working to get you the video link of it recorded! Thanks for being ON tonight! Reminder THIS is just a GROUP for Tracy and me to post so we don't blow up everyone's phones! What you learned, excited, crows or sharing post on my guest book HolliLowe.com (click sign guestbook)! #6 Make a list of your natural "talents"
HOMEWORK DONE by Sunday Night by Midnight - February 7th! You will email us the info to email above when complete! Make your OWN sheets to track your homework! Send us a pic of the lists etc!